Hamilton is a stellar player, he’s just not worth his asking price. 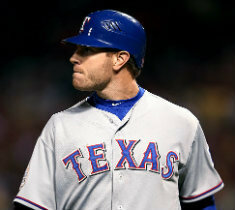 Most consider outfielder Josh Hamilton to be the cream of the crop of this year’s free agent market. It’s certainly hard to argue with that statement; Hamilton hit more home runs in the first two months of last year than any one Seattle Mariner managed to post over the whole season. But in taking his seven year, $175 million asking price into consideration, I’d much rather have Nick Swisher at a much lighter asking price on my team than the overly expensive Hamilton.Hamilton is as talented as anybody in the game, but $175 million is too much. Way too much. His $25 million average annual salary would give him the third highest annual salary in the history of the game behind Alex Rodriguez of the Yankees ($27.5 million) and Albert Pujols of the Angels ($25.4 million), and tied with Ryan Howard of the Phillies. His overall asking price would make him the eighth richest player in the history of the game, behind Rodriguez ($275 million), Pujols ($254 million), Joey Votto ($225 million), Prince Fielder ($214 million), Derek Jeter ($189 million), Joe Mauer ($184 million) and Mark Teixeira ($180 million). Hamilton has a number of flaws, both on the field and off the field, that should prevent teams from breaking the bank on his services.Over the course of his career, Hamilton’s been suspended a number of times due to drug and alcohol abuse, dating back to the start of his career in 2003. He’s very injury prone, as he has only played in 148 or more games once in his six MLB seasons. He is also seen as an inconsistent player; after starting out the first two months of last season hitting .370/.422/.763 with 23 home runs and 57 runs batted in, he then proceeded to slug a whopping .200/.286/.395 with 8 home runs and 25 runs batted in the following two months, finishing out the season hitting .278/.349/.559 with 14 homers and 44 runs batted in. In other words, the first third of the season he looked like the clear MVP frontrunner, the next two months he looked no better than a bench player, and at the end of the season he wasn’t an MVP, but he wasn’t a benchwarmer either. While Hamilton has loads of upside, I’d much rather have Nick Swisher, who isn’t nearly as talented as Hamilton, but also won’t cost nearly as much and offers a lot more consistency. Swisher has been very consistent throughout his career. Since the 2009 season kicked off, Swisher has posted no less than 3.2 WAR but no more than 4.1 WAR. He’s averaged 3.75 WAR over that time, and using the 1 WAR/$4.5 million rule, Swisher has essentially been close to a $17 million player. Early reports out of the GM meetings say that Swisher will likely have to settle for a three or four year deal at about $11-13 million a year, which certainly falls short of his asking price of Jayson Werth-esque money. Let’s just say that Hamilton decides to settle for a 25% discount and ends up signing for a six year, $130 million deal. Since 2009, Hamilton’s been a $20.5 million/year player, so you’re still going to be overpaying for him, even at a hefty discount. Even if a team decided to sign Swisher for say, five years and $75 million, quite a bit more than the reported contract he’ll likely have to settle for, you’re still going to be saving yourself a good $10 million which could be utilized to acquire other useful assets for your ballclub. Swisher has been a model of consistency throughout his career, and if teams are looking to get the best out of their buck, he would be a solid sign. While Hamilton is an outstanding player, he is likely going to be overpayed by a desperate team that will be constrained by his contract for the better part of the next decade. When I vote for the All-Star team every season, I vote for the players that truly deserve to make it to the Midsummer Classic. But most people have a different mindset. 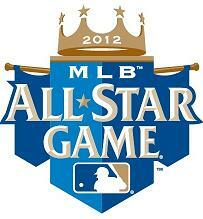 The All-Star game has become a popularity contest, not a game that features the game’s best players. Hence the reason that Derek Jeter has essentially won the shortstop vote once again by a landslide despite the fact that he isn’t even top-5 in the AL in shortstop WAR produced thus far in 2012. Every year, the manager of both leagues will tend to take a few of his players. That’s the way it’s always been. And chances are that the Royals will have a few representatives of their own considering that the game is being played in their home park. There is also the rule that every team must have at least one representative. So, here’s my list. I mostly used WAR to determine the team. You may agree or disagree with what I have here but remember that this actually has a little logic behind it. I tried to put together a team that has put up the best numbers yet may also appeal to a normal fan that is only familiar with the big names. After taking over an hour to thoroughly research everything FanGraphs has to offer, this is what I have decided on. There were some big time snubs left off the list, namely Cabrera, Hernandez, Sabathia, and Darvish, who would have made the team had the rule of every team must have a representative not been in order. Some surprises from this list include the Red Sox having just one representative in Ortiz and the AL West having as many representatives as the AL East. Overall, I like this list and I think it would make for an interesting ballgame. Let me know what you think in the comments. 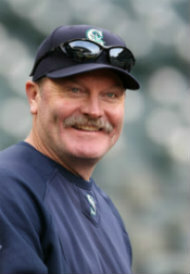 When the Mariners hired Eric Wedge in the winter of 2010, I had to say that I liked the move. Wedge had turned Cleveland from a young and inexperienced ball club into a playoff contender in just a matter of years. He is now the head of another young and inexperienced team in Seattle, and I have to question his decision making. Twelve of the twenty-five players currently rostered are twenty-six years of age or younger. John Sickels of Minor League Baseball said prior to the season that Seattle had the fourth best minor league system in the game, and with the progression of arms Danny Hultzen and Taijuan Walker, the team is about to get even younger. Even with this plethora of youth on the major league roster and more talent on the way, Eric Wedge is still insistent on playing the struggling veterans. One issue is Wedge’s infatuation with catcher Miguel Olivo. While there is good reason to have Olivo on the roster because of his ability to call a good game and occasional glimpses of power, he should be used as a back-up or in a platoon role at best. Everytime he steps up to the plate, you might as well hand the opposing team free outs – his 56 wRC+ and 13.5 K/BB ratio are certainly not of much help to the club. While he has thrown out 13 of 38 runners, good for 34% of all runners, Jesus Montero has thrown out 6 of 27 runners, good for 29% of all runners, while contributing much more to the team with the bat (99 wRC+, which is essentially league average). John Jaso, in limited playing time, has produced twice as much WAR as Olivo while managing to post a 123 wRC+ with .358 OBP and a BB% higher than his K%-it would seem to make a lot more sense to let Jaso stick around as the starter and give Olivo the boot to the bench. 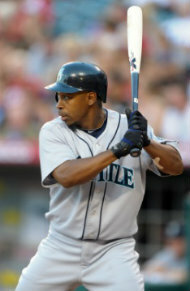 A glaring issue on this team is Chone Figgins. Fans are clamoring for his release with good reason-in the past two seasons, he has posted -2.1 WAR, good for the worst in baseball over that time span. Yet, Figgins still continues to collect his annual $9 million pay check while being of negative value to the club. While I’m sure the front office understands that he is a lost cause, I am under the impression that they are looking for a team willing to take on even the slightest amount of cash remaining on his mammoth contract that he inked in 2009. Figgins’ seemingly automatic strikeouts (25% K%) are wearing on fans and it’s time to take action and release him as soon as possible. Another developing problem is Ichiro Suzuki, who has meant so much to this team and the city of Seattle over his eleven year playing career, but his age is slowly but surely becoming a hurdle. Two years ago a .300+ batting average with 200+ hits was just expected out of Ichiro. Those days are now behind us. This year he’s posted a .255 average with an 80 wRC+ to date, simply not getting the job done. His skills on the base paths and gold glove caliber defense are still assets to the team, but on the same token this level of play is no longer worthy of receiving everyday playing time; he has played in sixty-seven of seventy games thus far. With Franklin Gutierrez returning, it is assumed that Michael Saunders will switch to a fourth outfielder role, while he is deserving of much more after posting 2 WAR and swinging a hot stick. I’m alright with Ichiro getting regular playing time, but not at the expense of young players that are actually contributing when given the chance. As a wrap, this team has many flaws and it’s essential that Eric Wedge, Jack Zduriencik and crew do their part to correct these things in order to maximize the teams’ production and get fans to the ballpark. I like Eric Wedge and I would hate for the team to have to fire its eighteenth manager in its thirty-five year history, but it’s time for him to step up his game. When I first heard the news that Ryan Braun won the appeal to overturn his initial 50 game suspension, I had two immediate reactions. The first was surprise; nobody ever won an appeal before. The second was also surprise, but more of a shake-my-head surprise; the MLB had messed up big time. Well, I was half right. Yes, Braun was the first player to ever win an appeal. I was right about that. I guess I was sort of right on the second part, but it wasn’t like I thought. The MLB (or whoever was in charge of the testing. For all intents and purposes, I will say the MLB.) apparently failed to follow procedure in collecting the urine sample. Although the urine contained synthetic testosterone (from what I know/read), the reason that Braun had the suspension overturned was the fact that the collector didn’t ship it out to the testing labs in the right time frame. Wow. What can we deduce from this? 1. The MLB hierarchy has every reason to be livid. This should send the higher ups in MLB into a frenzy. While you have to be mad that the suspension was overturned, it’s a huge slap in the face that it got overturned because of a stupid technicality. According to an ESPN article, the MLB is “considering its options.” I really can’t think of any options that they might have that can directly punish Braun. From what I know, they can’t appeal the appeal, and they can’t slap a punishment on Braun without some other lapse of judgement from the man. At best, I can only really see him getting fined, and I’m not even sure that’s possible. Essentially, MLB lost this one. 2. Braun won this time…or did he? Did Ryan Braun really help himself in the long run? error, thus allowing him to escape the suspension according to a source. Was it all worth it? In my opinion, a fifty game suspension and allegations about PED use really hurts. However, I think your reputation is hurt a lot more by beating the suspension just because someone made a technical error. Your image is hurt a lot more, especially since people will now remember that you beat the system for the first time. Essentially, you’re not guilty, but you’re still technically guilty. Braun in a statement said “I am very pleased and relieved by today’s decision. It is the first step in restoring my good name and reputation. We were able to get through this because I am innocent and the truth is on our side.” Did this really restore Braun’s reputation? Did he really get through this because he’s innocent? Again, Braun simply might’ve damaged his reputation by getting this appeal on his side. Dodging the suspension might’ve just lowered him even lower than he was before, especially since nothing was tampered with. 3. MLB’s drug testing policy may have had a problem, but the bigger problem was the leaked information. Yes, we have found that the drug testing policy allowed a player to dodge a suspension apparently because of a simple delivery error. While the procedure simply had that error and not one that concerned tampering or the specific science of determining synthetic testosterone, it is imperative to say that MLB had a large error as well. Two sources leaked out to ESPN that Braun initially tested positive. That is apparently against policy. In fact, more and more information managed to leak from those familiar with the case. That is simply unacceptable. With the kind of media era we are in and the fact that any PED use will get the fan’s hearts beating, this is an egregious error. You can’t have people thinking that Braun is a dead man walking without confirmation. You also can’t have people believe that he was innocent without that confirmation either. Simply put, the fact that Braun tested positive for PED’s and then won the appeal should’ve only be released today. It should only have been released by the MLBPA after Thursday’s appeal. It simply shouldn’t happen in the future, especially in today’s massive media era. The MLB should know that by now, and enforce the proper measures that this doesn’t happen again. Although this is easily overlooked, it’s still a big problem nonetheless for the reasons stated above. 4. MLB’s image is still tarnished. Taking the viewpoint of the entire game and not the organization, MLB still took a big hit from Braun’s positive test, even without a suspension. Braun was obviously the NL MVP, but he’s also going to be the target of many headlines this year. Braun without the bat of Prince Fielder was going to be a major headline this year in my opinion. I can assure you that, at least in the first third of the season, 70% of the articles that focus on Braun will have a footnote about the appeal and the general positive test. Is that really the best thing for MLB? There’s also the fact that one of the league’s big stars took a PED. Imagine seeing a headline that stated that Aaron Rodgers or Kevin Durant took a PED. Again, seeing a star dim because of a PED is never good for the general view of a league. Again, to sum it all up, Braun wiggled out of trouble but still tripped into another problem. From what’s been released, the situation might’ve gotten better right now for all parties involved, including the MLB, but different things will be written about this in the future. The ESPN story written about Braun is titled “Braun Wins.” Did he really? Let me make this point blatantly clear: no, I do not think the Yankees should sign/should have signed any of the big name free agents out there. Pujols, Reyes, and Fielder are obviously not fits due to the presence (and age) of Derek Jeter and Mark Teixeira. C.J. Wilson wasn’t a good idea in my opinion. A five-year-deal for an early 30s pitcher? He has a “J” in his first name? What could possibly go wrong? Then again, Wilson as a starter has provided more WAR in two years than A. J. (yes, I was referring to him) has in the past five years. Excuse me for being at least a little pessimistic here, but as you can see, I have reasons to have feared a Wilson deal. That’s another story though. Buerhle for four years wasn’t the best idea either. So essentially, I am glad the Yankees managed to control themselves and not splurge on a big free agent for the second year in a row (alert the presses and record books, we’re going for a third next year!). No one was worth it/fit on the Yankees in this year’s class. foot into the free agent market for a second time. They got it done early and managed to dodge all the heart palpitations and high blood pressure from having to hear rumors of Boston and Sabathia getting together. So that part, I am proud of the Yankees for doing. I’m going to mention Garcia again in a moment, but first I must mention potentially the BIGGEST Yankees move of the entire offseason (other than re-signing Sabathia): Winning the bid for Hiroyuki Nakajima!!!!!!!!!!!! Ironically, the Yankees might not even SIGN Nakajima as apparently he might just play out the year and try to play for Bobby Valentine and the Sox next season. I’ll save analyzing Nakajima if/when he gets to the Yankees. If he chooses not to, the biggest move for the Yankees will end up being either cutting Andrew Brackman or drafting more guys in the Rule 5 draft. If the Rule 5 draft is the biggest move for the offseason for the NYY, there’s a problem. The offseason is still young. I understand that. However, I thought the Yankees would be at least a little more aggressive in trying to get starting pitching. A Trevor Cahill deal recently got done. A Parker substitution in that deal could’ve been one of the Killer B’s (err, one or the other now). If the Yankees are reluctant to bring them up, why not trade for a ready commodity? The Yankees are a win-now team. Waiting that 1 or 2 extra years could be the difference from fizzling in the playoffs to winning number 28 for the Bombers. Yu Darvish is apparently not the choice for the Yankees. Should he be? back to the trade market again if you dislike the likes of Roy Oswalt or Edwin Jackson. Who’s out there? Shields or Garza? They’re both highly unlikely for the price and the team/executive that has them at the current moment. Gio Gonzalez? The Yankees just don’t know what they’re doing at the moment, as they are choosing not to go through either market. Why am I catching the anxious Yankees fan syndrome? The simple reason is I fully don’t expect the Yankees to win the AL East next year with the team they had last season, which is essentially the team they have right now with the exception of a few guys. Listen, Boston’s collapse last year was historical. Relying on the same type of thing happening this year is both stupid and unrealistic. Boston is my AL East winner next year barring any major, major setbacks. That leaves the Yankees with the Wild Card spot, which might not even go their way. You have the always feisty Rays with their strong core of young players and the pitching staff of death next year (even if they decide to trade Shields, the rotation is Price-Hellickson-Moore-Davis-Niemann. Yikes. ), and the loser of the AL West. Both the Rangers and the Angels are also teams that could leapfrog over the Yankees in a potential Wild Card race this season. Why am I so pessimistic about the Yankees chances? Quite simply, the Yankees are going to be a year older next year. The pitching staff this year wasn’t as much of a problem as it was before, but I expect it to be this year. Sabathia will be Sabathia, and Nova could capitalize off his great campaign last year. Hughes is still a huge question mark in my mind. I don’t expect Garcia to have as great of a year this year as he did before. Of course, AJ is AJ. To this point, the Yankees have not made a major move for a pitcher. This is why I’m so concerned about their lack of an offseason so far, no matter how early. Here’s my bottom line: the Yankees in my opinion are not a superior AL East team next year without making an improvement in the pitching staff. What worries me the most is their presence (or lack thereof) of things like Trevor Cahill talks which they could’ve gotten into or their apparently “lukewarm” interest in a potential difference maker like Yu Darvish. So yes, might this be an overreaction to a lack of activity so far? Yup, it probably it. However, it can’t help but worry you if you’re a Yankees fan that the Yankees have been inactive or even patient so far. If they were willing to be aggressive for Sabathia and Garcia early on, why not grab another guy? Yankees fever is hitting me early this year. I just can’t tell if it (or if the team) is good right now. Full speed ahead! Two posts just a few hours apart? Yep, it’s happening. This time, we’re going to venture into a more treacherous area for the Cubs: FIRST BASE. On the surface, you have a very curious player in Carlos Pena. There is the side of him that mashes, and the side that…well…does not. Guys like Pena have always confused me–if you have such a good eye at the plate that you can manage 101 walks, then how can your eye be so bad that you strike out 161 times while also hitting just .225? Adam Dunn (until this year) has been the same way; these guys are great at taking pitches, but they also cannot make consistently strong contact to save their lives. Pena had a solid season because he plays a decent defensive first, and he hits for power from the left side, something Tyler Colvin failed to repeat for the team after a sneaky 2010. Pena came on a questionable one-year, $10 million deal that includes $5 million in deferred payments for January 2012. That means he is not there for the Cubs next season, and they have some pre-Christmas shopping to do. Whether or not that shopping amounts to a superstar, a stopgap, or nothing remains to be seen. Certainly, though, the Cubs have a load of options on the market and within their own ranks. The free agents start with three familiar faces. Pena is out there once again, though he has Scott Boras on his side, king of numerical Twister. He will sit there and shower Pena with praise for those walks and bombs, while saying the strikeouts and horrid average are not that big of a deal. In his mind (and, probably, an AL team), that is worth 2-3 years at his 2011 rate of $10 million or so. Maybe he takes a little less, bypasses the deferred payments, and gets the multiple years that way. However it happens, Pena does not seem like a great fit for the Cubs. They still need that unicorn of lefty power bats, but they are unlikely to compete in a time where Pena is going to do his most damage, as he is not all that young. Sticking with the Boras team bring us to a divsion rival’s former bat, Prince Fielder. The Cubs would likely kill many times over to have a player like Prince. He plays OK defense (not great), hits from the left sdie (while crushing any and all challengers on the mound), and plays first. Of course, the Jim Hendry era (I have yet to THANK GOD that is over) rears its ugly head even after its death on this one. The Soriano and Zambrano contracts still sting and make any Cubs fan (myself included) cringe at the thought of a contract that pays even more than those clunkers. That Z and Sori still eat so much payroll is cause for concern itself. The Cubs HAVE to pay Matt Garza eventually (thanks again, Jim! ), hopefully soon. They also need a lot more than just a first baseman, so that $20+ million per season will not be a cure-all. It is certainly a start, but it is a pricey one at that. It might not be a bad time with the contract, since many million of dollars have been cut form the 2011 payroll, including Aramis Ramirez, Kosuke Fukudome, Jon Grabow (Hendry strikes again), Pena, Samardzija, and so on. The Cubs could afford Fielder if they wanted, but do they? Then you have his superstar partner in financial crime, Albert Pujols. If the Cubs will not pay Fielder, certainly Albert is no different, right? Maybe not. Prince is their perfect fit, but Albert is Albert Pujols. Though a righty–not the ideal fit of a lefty–Pujols is bigger than life at times. He would draw more fans than Fielder, something that is STARTING to become a slight problem in Wrigley, and he should outperform Fielder for about 5 more seasons. He is the best hitter in MANY years (and the best juice-free one–we think–in decades). There is no other Albert Pujols, no way. Still, Theo is in charge of the Cubs now. It was not until 2011 that Epstein threw a bunch of money (and prospects) at a first baseman. Before that, he had castoff David Ortiz, patch job fellows like Doug Mientkiewicz and Kevin Millar, and Boston-grown Kevin Youkilis. That is just the first name in many farmhands Boston brought to the table. You then have Pedroia and Lester, and several others. In fact, some mention that Theo is not the best at free agents deals (see: Crawford, Carl and Lackey, John). One thing people REALLY love with Epstein is his ability to grow a winner. Signing Fielder for Pujols breaks from that idea. In Theo’s world, Herculean hitter Dan Vogelbach of the Cubs’ 2011 draft class will be their future. We do not know much about him beyond SERIOUS power, but Theo works from within more than anything, or he swings a trade (see: Gonzalez, Adrian and Beckett, Josh). So we are at the small-time options. These might be a mixed bag, but many are there. Of course Vogelbach starts it off. The 2011 pick is nowhere near ready, so he is going to have to take a breather and toil in the minors. Tyler Colvin had some work at first in late-2010 and 2011, but he also was a horrible hitter this season. New Cubs manager X might choose to let him try again, we just do not know on that. He could also be used to replace Fukudome in right or Reed Johnson in the fourth outfielder role. We next turn to the other side of the plate and meet Bryan LaHair. LaHair is sort of tough to read. The guy just turned twenty-nine, meaning there has to be SOMETHING someone did not like that kept him from the majors for so long (minus 150 ugly plate appearances in 2008 with Seattle). This season saw LaHair rise to the occasion, working out as the AAA hitter of the year for the Iowa Cubs. Hitting a league-healding 38 home runs with a pretty .331 average, LaHair got a little attention from Chicago late in the season. Beware the small sample size, but Bryan did pull off a decent .288 average, .885 OPS, and a pair of MLB homers. After the three key free agents and three in-house options, you get to start looking at guys like Michael Cuddyer or bringing back Aramis for a positional change (note: Aramis’ agent says that he is done in Chicago). Really, there are only two options that jump out. Pena just will not be of use going forward, so paying serious dollars for a stopgap is pointless. For all of his greatness, making Theo’s first major move as GM the biggest gamble in team history would possibly be a disaster for him, so that leaves Albert out. Some could argue Prince is a bigger gamble, but he will probably be 2-3 years short of Albert’s contract, along with perhaps $5-8 million under in annual salary. The dollars and length make Prince a reasonable risk. He is younger as well, meaning he will be further from his end when the Cubs can compete, likely in the 2013-2014 window, if we’re lucky. Other than that, you have to stick with who is already here. Again, Vogelbach is not going to be ready until 2014 or so, one would think (depending on how he progresses, maybe 2013 or 2015), putting him out of the question. Really, playing a platoon game might work. The Cubs could let Colvin and LaHair battle it out in Arizona, giving the starting nod to whomever stands out. If neither does, let LaHair be the lefty killer and Colvin his left-handed counterpart (meaning Colvin would get the majority of the chances). If the gamble is on one or the other, LaHair is probably the better bet. He has not proven he cannot hit, while Colvin struggled last season, to put it lightly. Prince would be an amazing guy to get for ticket sales and generally great production. If Theo is scared of another Crawford move, he should probably let LaHair get first crack at the job come February, seeing as he is a more natural first baseban than Colvin. It is a tough call I would hate to make, that is for sure. The Cubs have a serious issue with this, and Theo is going to have to put all of his talent to task to solve it…once he gets the team a manager, of course. It seems that we’re back, and I get first dibs on kicking it off. Little difference: I’m going to started putting my name (Keith) on my posts, rather than my post name (cubs223425). Maybe I’ll put both, like I am on this one, we’ll see how I decide to go. As a Cubs fan, I feel obligated to start with analysis of the Cubs. I’m going to go position-by-position with this, deciding towards the end if I want to do pitching as rotation and bullpen or staff-wide. We’re going to start, though, with the catcher position. The format of this post will likely be mimicked on the others, and the first order of business is the past. Since 2008, the Cubs have leaned on Geovany Soto at the catcher position, with Koyie Hill curiously rostered behind him. Soto did a good job in many instances, but he was certainly not without flaws. One of the biggest is that he was hurt quite a lot in 2009 and 2010, averaging 103.5 games played those two seasons. 2007 saw him play a robust 141 games, and 2011 had an acceptable 125 appearances behind the plate. When evaluating his offense, it is a bit tricky. Soto has both good and bad things to his game. On the positive side, he has a history of putting up a solid OBP (career .348). His power is not elite, but it is above-average when he is healthy (we would likely see 18-22 HRs consistently from Soto, if he could manage 130+ games played). Then we have the cons: consistency being the big one. His average never stays the same. His per-season batting averages from 2008-2011: .285, .218, .280, .228, respectively. In 2011, that .348 career OBP was bogged down because of his .310 OBP during that campaign. This leads to a conundrum going forward: should Soto even be with the Cubs in 2012? Obviously, in terms of pure value, yes. Soto is an above-average catcher, and an overall benefit in most instances. However, the Cubs might not need him. For 2012, the Cubs are not likely to win. For that reason alone, trading him might be a better idea, a chance to reload a little bit on the farm and save on his likely $5 million+ salary (an arbitration bump from his 2011 salary of $3 million). If not for Jim Hendry, the Cubs would likely have a major league-ready option to replace Soto in Chirinos, but we’ll ignore that rant. They still have a pair of other nice catchers that could get a crack at the job for next season anyway. My personal preference is Welington Castillo. Though not in a lot of time, Castillo had solid AAA numbers in 2011. He popped 15 home runs in 251 plate appearances, meaning a 20 homer season from him in the majors is a possibility. His .351 OPS is certainly a number worth looking at in the majors. Perhaps in a full-time role, a catcher with 20+ home runs and an OPS at or over .800 could happen. Then there are those who believe in Steve Clevenger. Just 25, Clevenger had some VERY tasty numbers in the minors. In 120 games, his OPS was .857, though it was more from the OBP (.383) than the power (.475 SLG). He certainly looks like a possible long-term solution, but giving Castillo a chance first seems logical. Regardless, the intent is to replace Soto. As said before, the Cubs are likely going nowhere next season. They just lack too much (as I will cover in more articles) to compete. After that, Soto is going to get ANOTHER raise, and will hit free agency after 2013. For 2013, it is tough to see the Cubs really going anywhere in terms of a deep playoff run, but two years is forever in baseball. With that though, what is Soto worth to the Cubs, a few more homers and fans? The sooner you trade him, the more you are likely to get back (the catcher market is not exactly amazing, and two years of Soto is more than just one year of him). So where does this leave the Cubs at catcher? Hopefully, without Soto. Trading him to help kick-start Theo Epstein’s farm overhaul would save them on a few million for 2012 and 2013, give the younger guys Castillo and Clevenger a chance, and add to the depth of prospects the Cubs seem to somewhat lack. The Cubs should let Castillo start 2012 as their starter. If he does not work out, let Clevenger try. There really is nothing to lose in terms of meaningful wins and losses. At worst, the Cubs lose a couple more games (Soto is about a 2-WAR player, 3 tops). At best, the Cubs save money, add prospects, and start the Epstein era early with strong play from Castillo and/or Clevenger. There really is no reason to not try. Above all else: PLEASE do not bring Koyie Hill back.